There is no manual for the perfect parenting. We do what works for our families to the best of our abilities. When I was a young mom and it was time for my babies to being sampling food. I just let them eat off my plate. I actually used to bird feed them. I'd chew it up just a bit and then put it in their mouths. That way I was sure, they wouldn't choke on anything I missed by spoon feeding them. In my home there would be no personal catering to singular needs. I cook for the family and we all eat together. I was not going to make 3 different meals for 3 different people and etc. I think parents need to learn the importance of easing their babies into the family as they develop instead of giving up their rights and allowing the child to lead which can wreak havoc on mealtime as todders are simply not capable of being considerate in their demands. But just because it wasn't so difficult for me, doesn't mean so many of you moms aren't struggling or have struggled with mealtimes in your home, so here is a really good book, written from experience that is bound to help your efforts and be a nice gift for someone else! The book: Give Peas a Chance - The Foolproof Guide to Feeding Your Picky Toddler to help new moms at this phase of their parenting. The book covers pretty much everything!! There are great stories from other parents and real life scenarios on how a situation could be handled differently with better outcome than a screaming toddler and a crying mommy! Definitely a must read if you need help with mealtimes in your family. Any parent who has ever begged their child to try “just one bite” can now make meal time a snap! Give Peas a Chance by pediatric nutritionist (and mom of a picky eater) Kate Samela is the ultimate survival guide for parents of picky toddlers. Feeding children nutritious meals can feel like a daunting and impossible task, creating a pattern of confusion surrounding feeding infants and toddlers among parents. 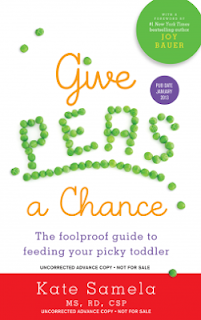 Give Peas a Chance provides parents with a unique set of tips and secrets to create and foster a healthy food relationship with their toddler and, most importantly, helps them keep their sanity at the dinner table. Is your toddler really a picky eater? —Many parents are surprised to find out that some “picky” eating habits are perfectly normal during a toddler’s developmental stage. Learn how to develop a sense of clarity about your child’s natural desire to eat small amounts of food on-the-go. —Parents are often afraid to move their toddler to table food, because they fear their toddler could not eat enough on his own. Learn how to make healthy and safe alternatives to baby food from your own kitchen that will help you make the transition. —Understanding key concepts, such as, it is common for your toddler to eat only one “good” meal per day or every other day, will help you learn how much food is enough for your tot to thrive. — Supporting your child’s digestive health is one of the most important factors when potty training. Learn how to manage digestive issues through incorporating natural foods such as pear juice, garlic, and applesauce, and find out if going gluten─free is best for your child. —Find out why foods such as yogurt, oats, leafy green vegetables, and even salmon are essential to incorporate into your child’s diet and how to put together quick easy recipes, kid-friendly table settings, and a feeding schedule that fits into your toddler’s on-the-go lifestyle. Kate Samela, MS, RD, CSP, is a pediatric nutritionist. She has taught the topic of pediatric nutrition to hundreds of medical, nutrition, and nursing students throughout the East Coast at The Mount Sinai Hospital in New York City, and as an adjunct professor at New York University College of Education. She works at Connecticut Children’s Medical Center as an outpatient dietician. She lives in Connecticut with her husband and two children, one of whom is still in the picky eating stage. You know, for me, this is great. I find myself constantly cajoling my little one to try something, only to get, "Okay, I'll try one taste," and then usually an, "I don't like it." Sometimes he surprises me, but usually not. I keep trying, but more often than not he ends up eating the things on his plate he likes, and leaving the others untouched. The nutrition values alone worry me and I supplement w/a vitamin, but it would be nice to find a way to get him to just eat. I'm going to be checking this out and than you for sharing it. Sounds like a great book for picky eaters. Sounds like a good book. My 5 year old is my picky eater and I have to sometimes hide the veggies to get him to eat them. I love the title of this book! Luckily none of my kids were picky eaters. I think they were all part garbage disposal. Probably why we had poison control on speed dial. I am lucky to have a child who eats anything. My oldest was like this..I used spaghetti sauce to hide vegies! This looks like a book I need to check out. This sounds like an awesome book. I think my 1st child was picky because I was too careful about what I fed her. My second was fine. He ate what we served!! I feel better knowing that when my son eats 1 decent meal it is not necessarily a bad thing. I am totally getting this book. I have a picky 2 year old. We simply feed everyone the same thing. Game over. However, there is always something for everyone. Our food budget can't tolerate picky eaters. Neat ideas. So glad I found this post! We have such a picky toddler and I am going to check out this book!